Residents continue to have a hard time selecting the best head of government of the past three decades. Vancouver, BC – On the eve of “BC Day”, most British Columbians remain proud of their province, but fewer are convinced that their children will continue to reside here, a new Insights West poll has found. 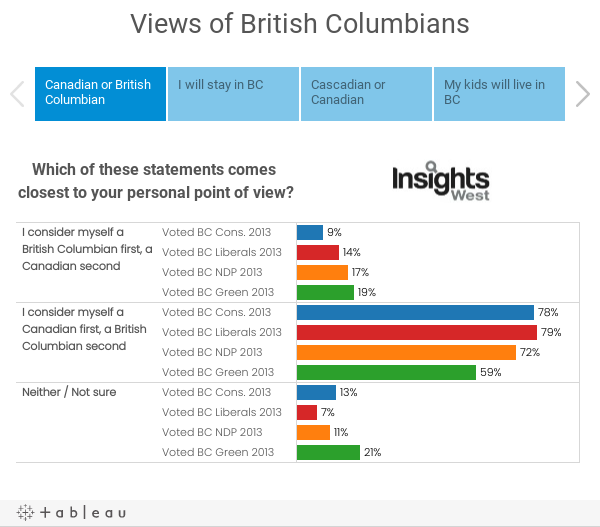 In the online survey of a representative provincial sample, more than three quarters of British Columbians (78%) believe they will stay in this province for the rest of their lives. The finding represents a six-point drop from a similar Insights West survey conducted in 2014. When asked about their offspring, 56% of British Columbians say they believe their children will reside in BC—a 10-point drop in two years. Almost two thirds of British Columbians (63%) think that the views of BC’s residents are different from the rest of the country, and 87% say they are very proud of the province that they live in. While three-in-five British Columbians think they have more in common with the people of Seattle and Portland than with those in Toronto or Montreal (59%, -9), only one-in-ten (10%) believe BC would be better off as its own country. About one-in-six residents (16%) say they consider themselves “British Columbians first and Canadians second”, including 18% of those aged 35 to 54. British Columbians find it difficult to select the best head of government of the past three decades. More than a third of residents (37%, -3 since 2014) are undecided, with Mike Harcourt (21%, +2) and Gordon Campbell (13%, unchanged) reaching double-digits on this question. When asked about the worst recent premier, Christy Clark leads with 30% (+5), followed by Campbell with 16% (-9), Glen Clark with 13% (-5) and Bill Vander Zalm with 8% (-5). Results are based on an online study conducted from July 12 to July 16, 2016, among a representative sample of 817 British Columbian adults. The data has been statistically weighted according to Canadian census figures for age, gender and region. The margin of error—which measures sample variability—is +/- 3.5 percentage points. Click here to view the detailed data tabulations.